Sound sensation. 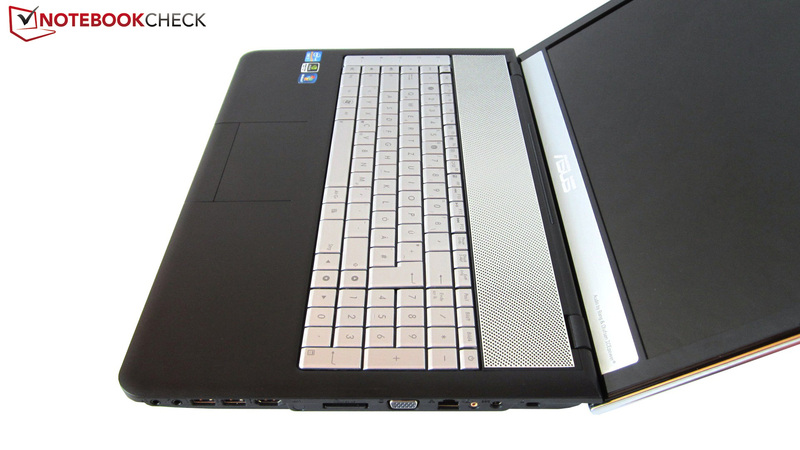 Average all-round laptops frequently suffer from poor picture and sound quality. 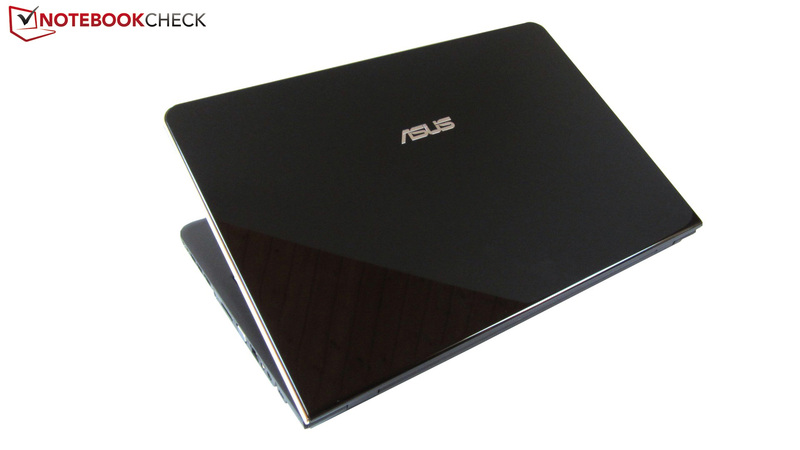 Asus masterly breaks out of routined patterns and presents a fairly expensive, but largely convincing multimedian called N75SF. 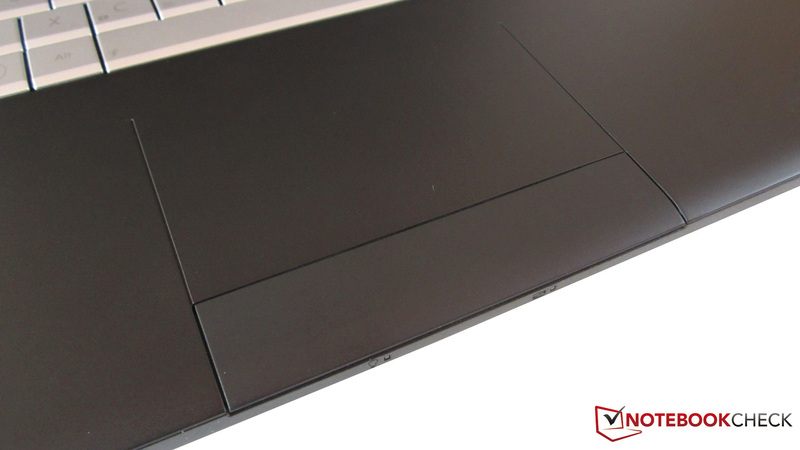 Find out where the strengths and weaknesses of the 17 inch device are in our review. When only the price is considered, the N75SF might not seem particularly attractive. 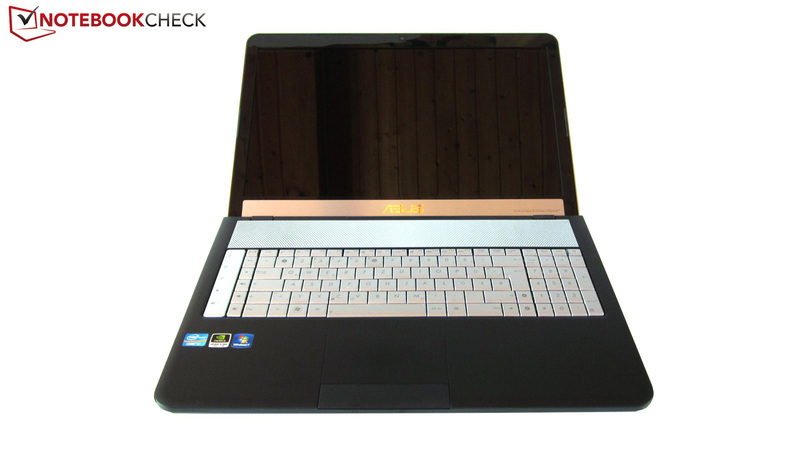 Over 1000€ for a multimedia laptop from the upper midrange? As soon as you start to study the list of equipment, it soon becomes clear why Asus is demanding an above-average amount of money. 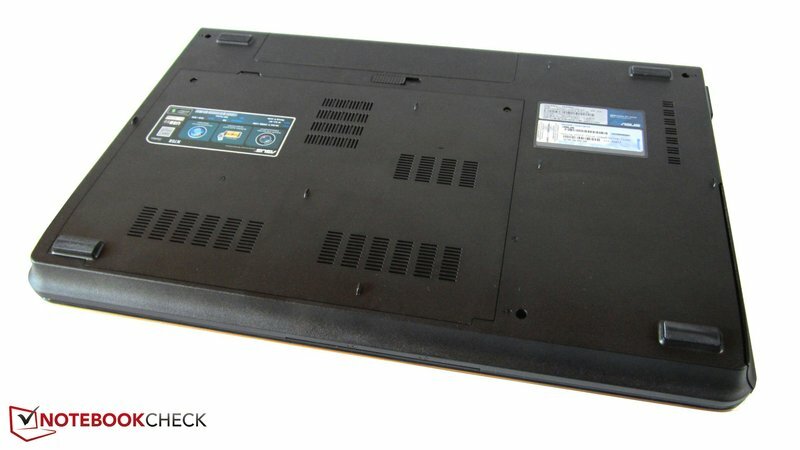 Beside a Blu-Ray drive (burns both CDs & DVDs) and eight GB of RAM, the 17 inch notebook has a hard disk capacity of 750, respectively 1500 GB. The graphics card is also not bad - Nvidia's GeForce GT 555M just scrapes by the high end range. Naturally, a new Sandy Bridge processor model from Intel is used. It either has two (Core i5-2410M/2430M) or four cores (Core i7-2630QM/2670QM). The display has a resolution of either 1600x900 or 1920x1080 pixels. We snatched the N75SF-V2G-TZ117V for about 1200€ (see data sheet on the right) and put it through its paces. The N75SF looks a bit bulky when it's closed. The shape won't likely knock anyone's socks off. With exception of the metal rim, we deemed the exterior design as commonplace. Moreover, it has a sensitive high-gloss lid where fingerprints are seen very easily. The notebook looks a lot better when it's opened. Many silver elements significantly freshen up the looks. We particularly liked the rubberized wrist rest. 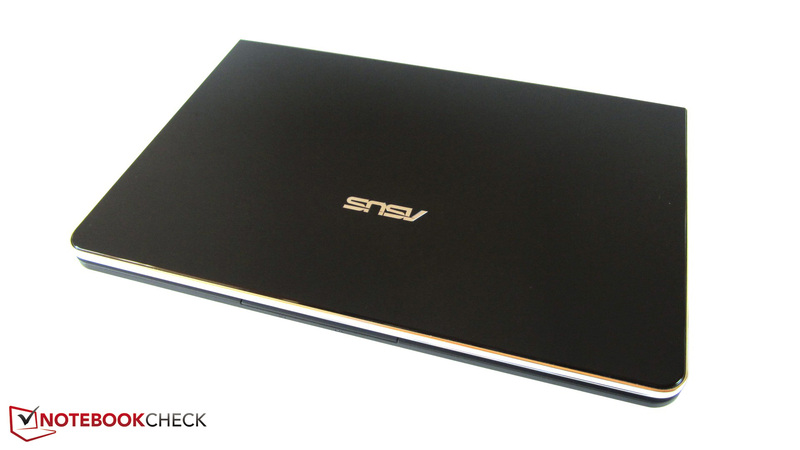 Although Asus mainly uses plastic, the N75SF doesn't feel cheap in any way. Except for the protruding drive, there isn't much reason for complaint about workmanship, either. The case has an overall good stability. 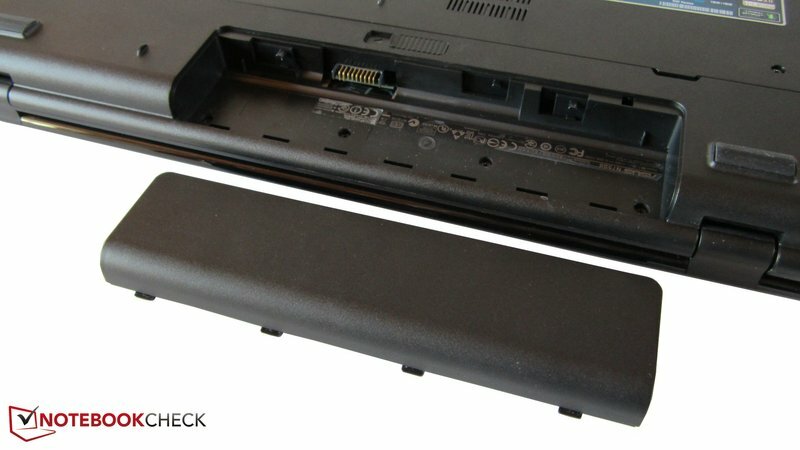 Merely the battery's area (top) and the fan openings (bottom) can be depressed a bit. As in many other devices, the lid is the biggest weak point. The display can be evidently warped by both hands. Another blemish: A hefty creaking noise is heard when the touchpad is used with unnaturally high pressure. 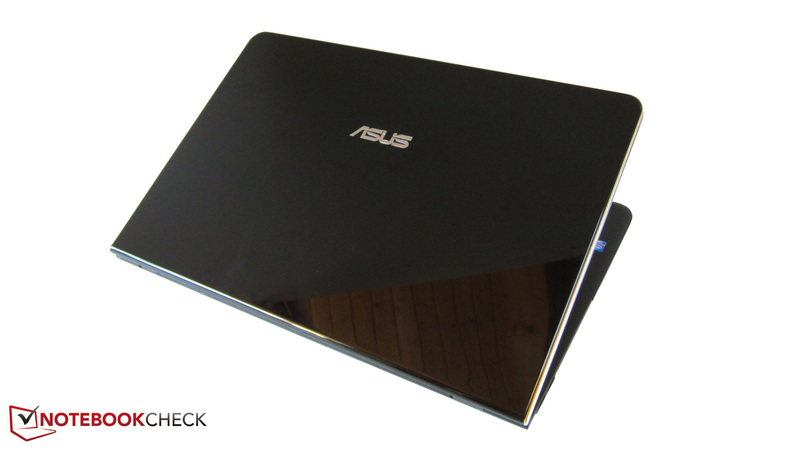 Asus could also make improvements on the hinges. For one thing, they don't do their work silently and for another, the base unit lifts during opening. 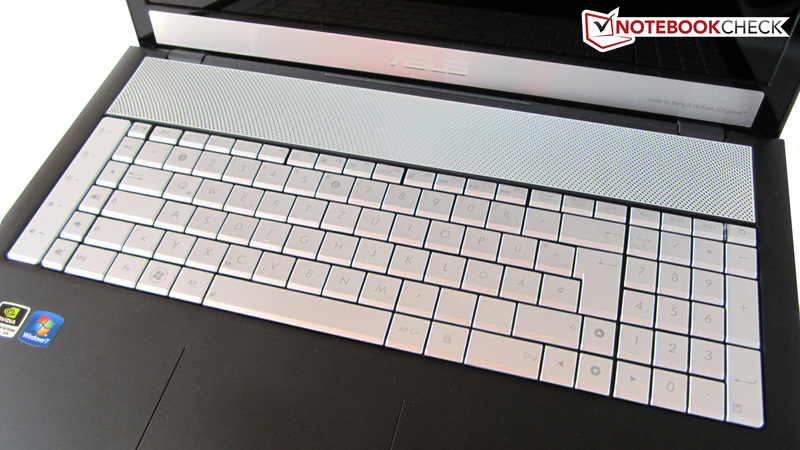 Moreover, surface vibrations also cause the screen to wobble to an degree. The N75SF isn't made for frequent transportation anyway. Nearly 3.7 kilograms aren't comfortable to carry around over a longer time. The connectivity isn't quite as expected. 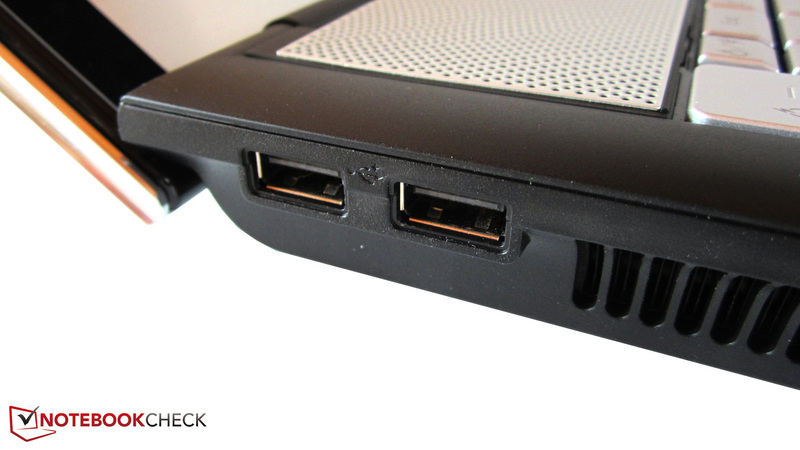 Although the N75SF has two cutting edge USB 3.0 ports, it doesn't have an ExpressCard slot, a FireWire or an eSATA port. Most of the interfaces are found on the right. In addition to the aforementioned USB 3.0 ports, there are two audio jacks (headphone/microphone), a 4in1 card reader, a VGA and HDMI out as well as a RJ45 Gigabit LAN port. The right is finished off with a power socket and Kensington Lock. The left only has two USB 2.0 ports. Both the rear and front are completely free of ports. The interface positioning isn't quite as appealing in our opinion. The user's workspace on the right will be restricted when many external devices are connected. There aren't any surprises in terms of wireless interfaces. The built-in wireless module (Atheros AR9002WB-1NG) is capable of WLAN b/g/n and Bluetooth 3.0. The manufacturer again overdoes it in terms of software. The notebook is delayed by dozens of programs (some absolutely superfluous) in its state of delivery. That elongates the boot times and general response rates directly after system start. The notebook can first really speed up after an uncompromising delete action. Nevertheless, we would like to take a closer look at a few components. While the "Splendid" technology ensures a vivid picture, "Power4Gear Hybrid" is a synonym for special energy modes. 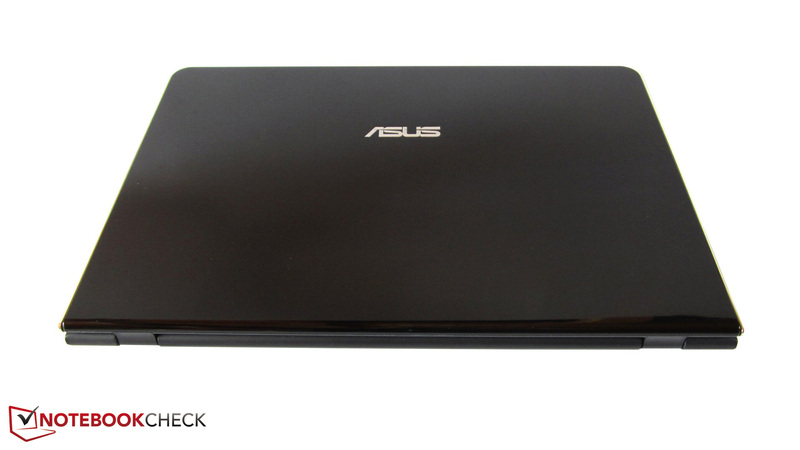 Great: Asus delivers the N75SF with CyberLink's Power DVD 10 to play Blu-Ray disks. The scope of delivery is also impressive. Besides the (120 watt) power adapter and the (6 cell) battery, Asus includes a few cable fixers, a small mouse, a manual, a warranty card and a driver & tool DVD. 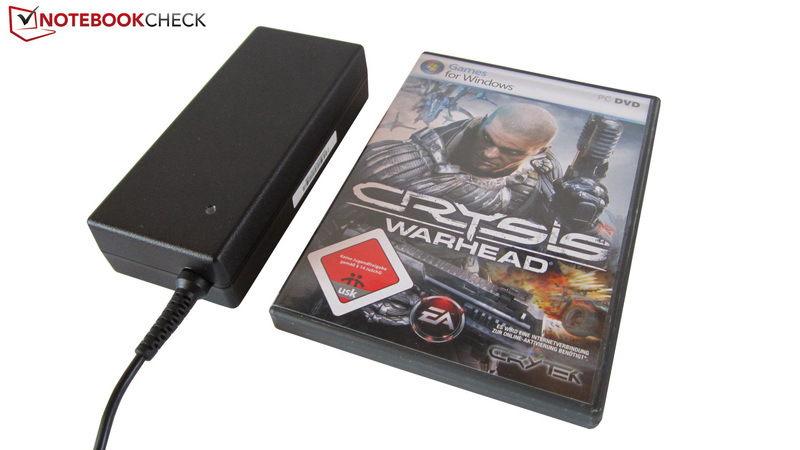 Beyond that, the buyer will find a cylindrical subwoofer that can be connected on the laptop's right. 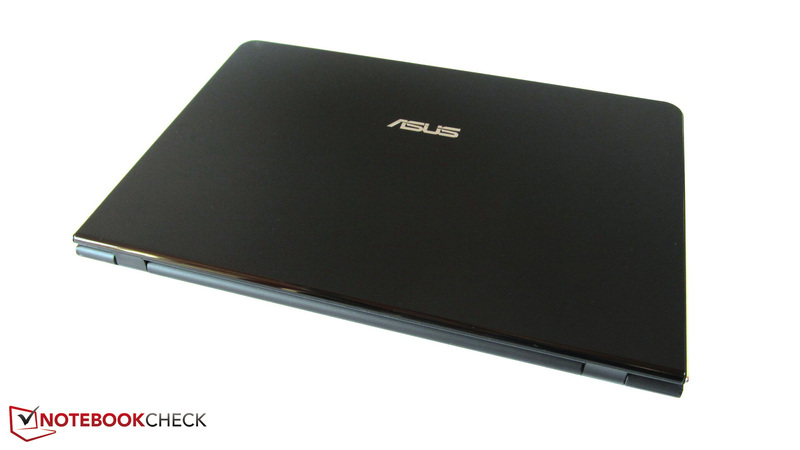 Asus grants a warranty of 24 months (12 months on battery). The keyboard gives a mixed performance. With exception of the F-row, the keys are agreeably sized (17x17 millimeters). However, the symbols are difficult to read from some angles because of the poor lettering. The combination of the smooth surface and unfavorably placed multimedia controls (left beside the main field) caused us to frequently hit the wrong key in the beginning. Furthermore, the pressure point and stroke could be more defined. The layout is basically all right, whereby some may be annoyed by the fact that "INS" and "DEL" are mapped on the same key. Otherwise, we would also mention the cheap sounding typing noise. Unfortunately, there is no light installed. 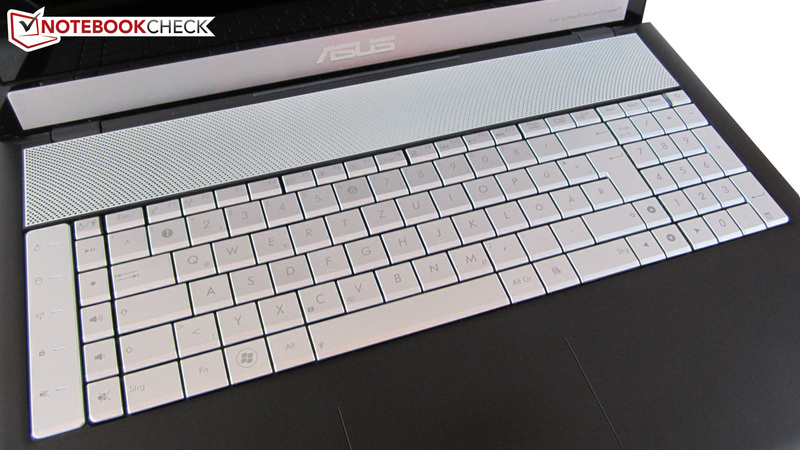 The touchpad can score better. On the pro side, there is not only the generous size (108x60 millimeters), but also the pleasant rubber surface that ensures an acceptable gliding capability. The touchpad can accumulate more bonus points with the supported gestures, which can be implemented by two or three fingers, as usual. That facilitates working considerably. Of course, a horizontal and vertical scroll bar exists at the edge. Basically, the touchpad works fairly reliably. Its precision is average. Great: Asus has included a deactivation option so that gamers don't have to curse about unintentional inputs during games. Meanwhile, we have to mention the unsatisfactory orientation possibility negatively. 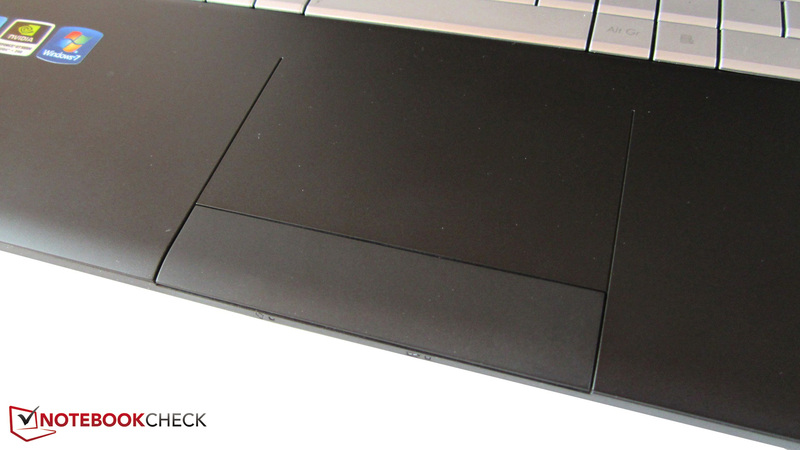 The touchpad is neither lowered nor can it be distinguished from the wrist rest by color. Although the GeForce GT 555M is sooner designed for resolutions in the HD+ range (1600x900), the manufacturer installs a Full HD display in the model at hand. Thanks to 1920x1080 pixels, the picture looks very sharp and detailed. Two adjacently opened windows aren't a problem in contrast to lower resolutions where the user is always busy with scrolling. Meeting the multimedia claim, Asus has opted for an aspect ratio of 16:9. 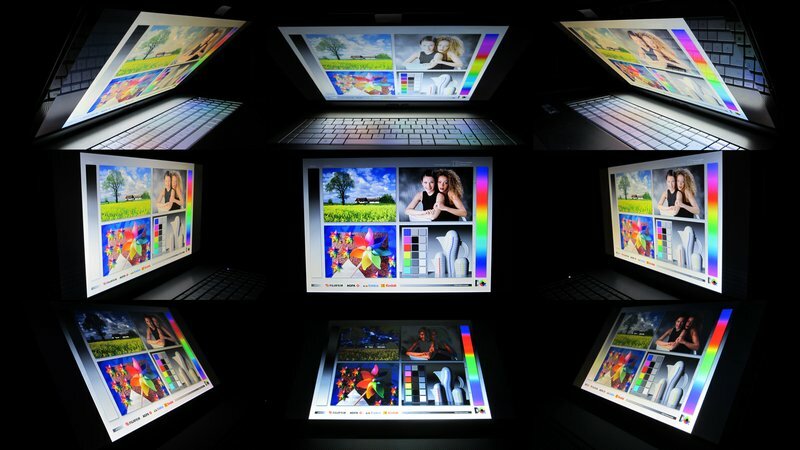 LED backlight has become standard in the meantime. We were pleasantly surprised by the determined rates. Asus fortunately isn't content with the (otherwise common for the industry) run of the mill screen, but spoils the user with a high-end representative. The first thing that will likely strike the buyer is the good luminosity: An average of 289 cd/m2 are more than decent. It's even recommendable to reduce the brightness for office and Internet work. The low black value also deserves high praise (0.32 cd/m2). In contrast to most other devices, dark areas don't have an intense gray cast. The contrast also puts the majority of the competition in its place. 919:1 is an excellent rate (an average laptop only achieves about 200:1). The colors make a fairly saturated impression. Games and movies are rendered adequately. Nevertheless, the display quality won't quite suffice professional users. As can be seen in the following pictures, the screen already has problems with the sRGB color gamut (average users can confidently ignore this fact). 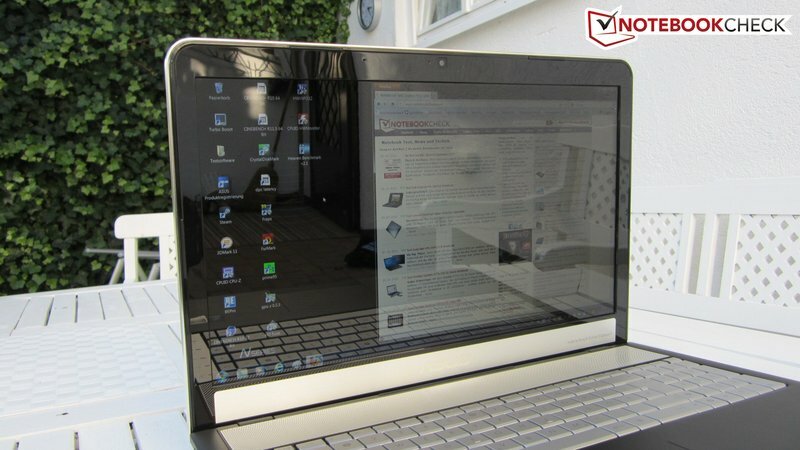 Despite the reflective surface, the 17 inch laptop can also occasionally be used outdoors - thanks to its high brightness. However, outdoor use isn't much fun after all because the user is faced with the typical reflections of a glare screen. A matt surface would have been at the expense of color saturation, but it would have been a lot easier on the eyes. Overall, the N75SF is primarily suitable for indoor use. The viewing angles equal the display's other qualities. A larger deviation is needed to provoke an image deviation particularly on the horizontal plane. 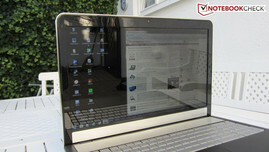 Thus, the notebook is also suitable for use as a TV for several persons. 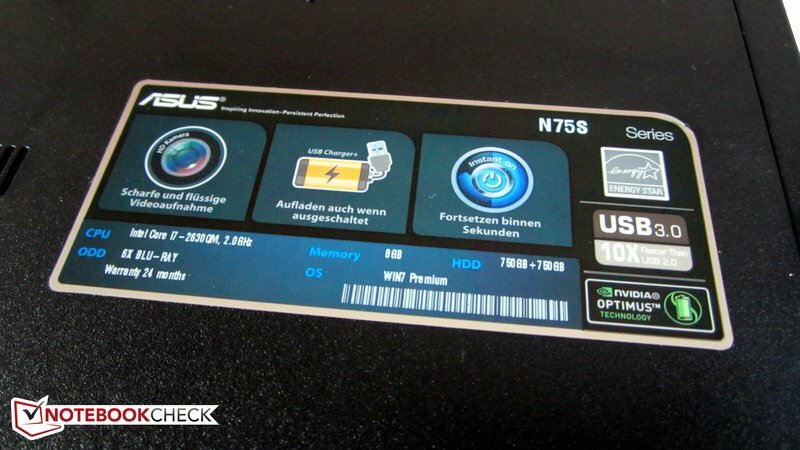 In order to equip the user suitably for the future, Asus installs a quad core processor into most of the N75SF models. The Core i7-2630QM, immensely popular among manufacturers, is based on Intel's current Sandy Bridge architecture, which boasts high performance and good efficiency. In addition to 995 million transistors, the CPU that is manufactured in a 32-nm process contains one six MB L3 cache (Core i5 series: three MB). The basic clock of 2.0 GHz no longer causes storms of enthusiasm. Thanks to the Turbo Boost function, the processor can however be automatically overclocked to a maximum of 2.9 GHz when required. Potential buyers who take a more careful look around will perhaps find a model with the newer Core i7-2670QM, which can clock higher by 200 MHz, so 2.2 up to 3.1 GHz (approx. 7% faster). But no matter if 2630QM or 2670QM: Both quad cores are able to process eight threads at the same time due to the simulation of four virtual cores (Hyper Threading Technology). Beyond that, all Sandy Bridge processors have the embedded graphics chip, HD Graphics 3000, in common. 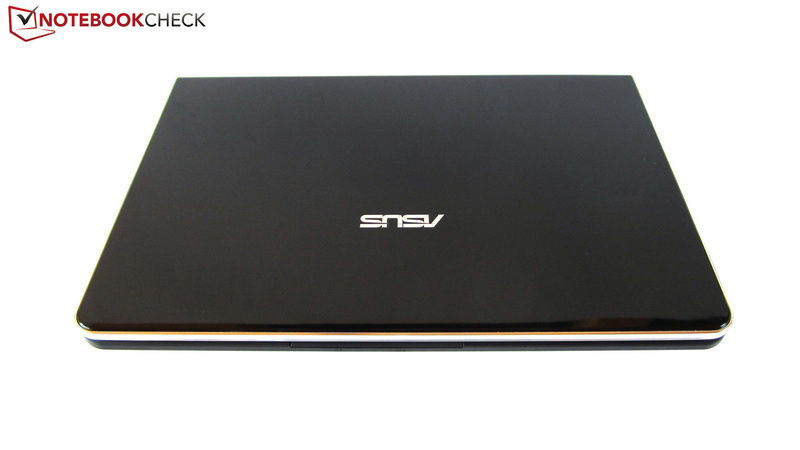 It enables the notebook manufacturers to implement a graphics switch. The Core i7-2630QM is partly on a higher performance level than its dual core Sandy Bridge family members in the CPU benchmarks. The Core i5-2410M, frequently installed in laptops, is already slightly defeated in Cinebench Single Core Rendering 64 bit (loads one core) (here the HP Pavilion dv7-6101eg as an example). The Core i7-2630QM has the lead by almost 2% with 4634 to 4551 points. The gap increases massively in Multi Core Rendering (loads all cores): 16836 to 9660 points equal a plus of 74%. A DirectX 11 capable model from Nvidia is used as the graphics card. The GeForce 555M based on the Fermi architecture places itself between its extremely successful family members, GeForce GT 555M (midrange) and GTX 560M (high-end) in term of performance. 1170 million transistors, 144 unified shaders, a 2048 MB DDR3 video memory and clock rates of 675, 900 and 1350 MHz (core/VRAM/shader) ensure that the latest games can generally be played in high details. If a game doesn't run smoothly, it is partly because of the memory bus of only 128 bits. 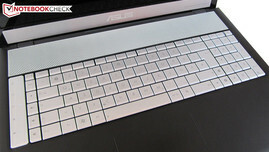 Asus should have preferred a version with a 192 bit interface, like Dell uses for example (see XPS 17 or Alienware M14x). Nevertheless, the performance is over-averagely good for a multimedia notebook. Nvidia can also boast with features. The PhysX technology is of particular interest for gamers. As the name already indicates, it takes care of calculating physical effects (takes its toll on performance in supported games). 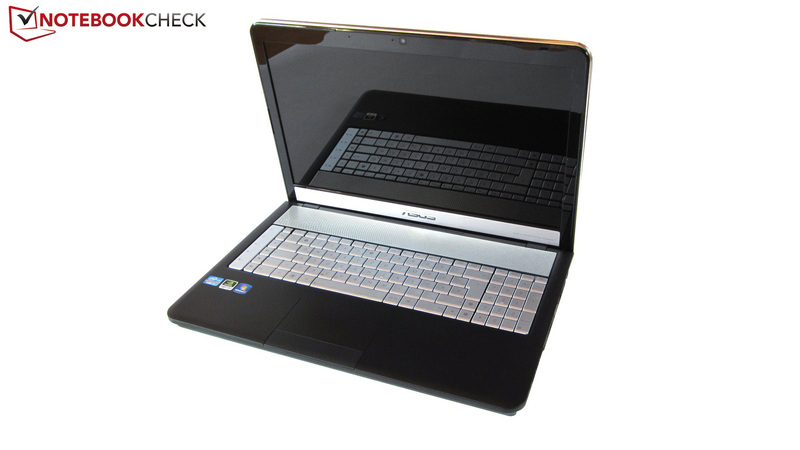 Like more and more midrange notebooks, the N75SF also has automatic graphics switching. Nvidia's Optimus technology activates either the Intel or the GeForce GPU for performing graphics calculations, depending on the current requirement profile. Thus, energy is effectively saved in less demanding tasks, such as Office or Internet, which in return is of course beneficial for the battery life. Optimus works quite reliably and manual interventions are hardly necessary. Nvidia's control panel bids numerous intervention and setting options when required. The GeForce GT 555M had to contend against the direct rival, AMD's Radeon HD 6770M (HP Pavilion dv6-6008eg) in the graphics benchmarks. As expected, the Nvidia GPU takes the lead in the DirectX 11 based Unigine Heaven 2.1 benchmark. The advantage adds up to a whole 11% with 18.7 to 16.9 fps (1280x1024, high, normal tessellation). The situation is completely different in the very demanding 3DMark 11 benchmark. While the Radeon HD 6770M achieves a GPU score of 1379 points in the test, the GeForce GT 555M has to be content with a 9% lower score of 1258 points (1280x720, preset performance). Two 750 GB HDDs from Samsung (not RAID), called ST9750423AS and run with 5400 rpm, are under the hood. 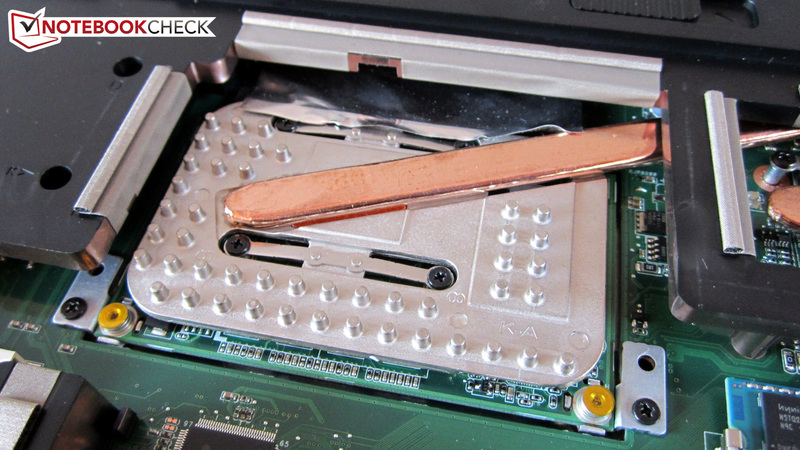 We check the system hard disk with the tools HDTune and CrystalDiskMark. A sequential read and write rate of 87, respectively 82 MB/s is good, but not extraordinary. The access rate of 17.8 ms also proves to be average. Strange: Alike its smaller brother, the N55SF, the transfer rate caves in massively in between (see HDTune screenshot above). 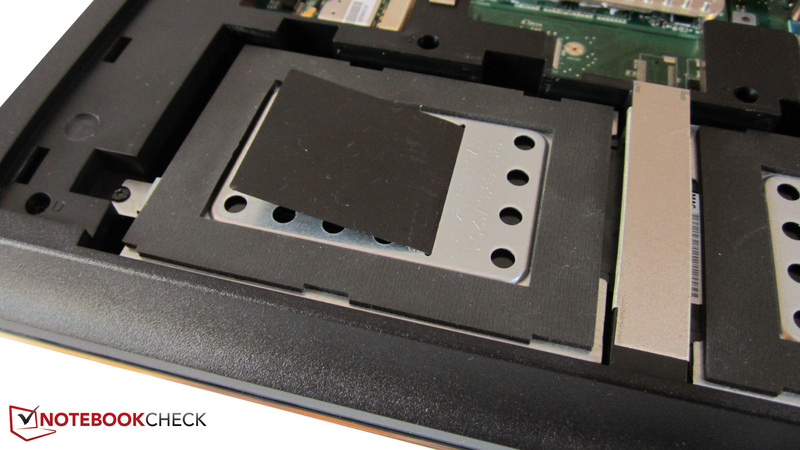 Since both hard disks can easily be exchanged, there isn't anything standing in the way of retrofitting them (e.g. with a solid state drive). The overall performance of N75SF is in the midfield. 7339 points in PCMark Vantage are on a par with equally fast and comparably equipped devices, such as the Medion Erazer X6815 or the Acer Aspire 7750G. 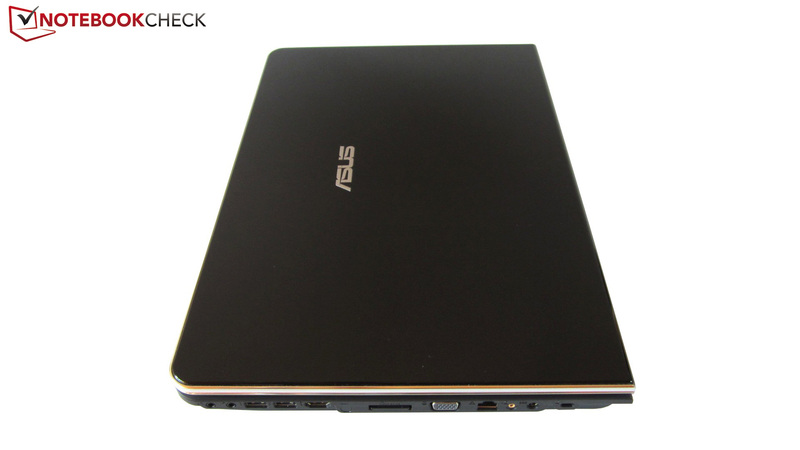 Asus would have had to give the 17 inch device a solid state drive for a significantly higher score. We've taken a closer look at the gaming performance with three current tracks. Codemaster's Formula 1 racer isn't displayed smoothly in maximum details. The race game stutters along with 20 fps when 1920x1080 pixels, four-time antialiasing and "Ultra" pre-settings (DX11) are used. In contrast, 1366x768 pixels, high details and two-time antialiasing ran well with 53 fps. We would recommend using high details, four-time antialiasing and DirectX 9 mode in the native resolution. The GeForce GT 555M also has a hard time with the first person / role game mix, Deus Ex 3. A combination of high details (DX11), MLAA, 16x AF and 1920x1080 pixels lead to modest 19 fps. In order to really enjoy the dusky sci-fi world, it's necessary to reduce the resolution, detail level and/or quality enhancements. For example, we ended up with 51 fps in 1366x768 pixels, medium details (DX9), edge AA and 4x AF. The extremely successful soccer simulation, Fifa 12, isn't a problem for the GeForce GT 555M. Even 1920x1080 pixels, high details and four-time antialiasing don't bring the multimedia laptop out of step: 96.8 fps speaks for itself. 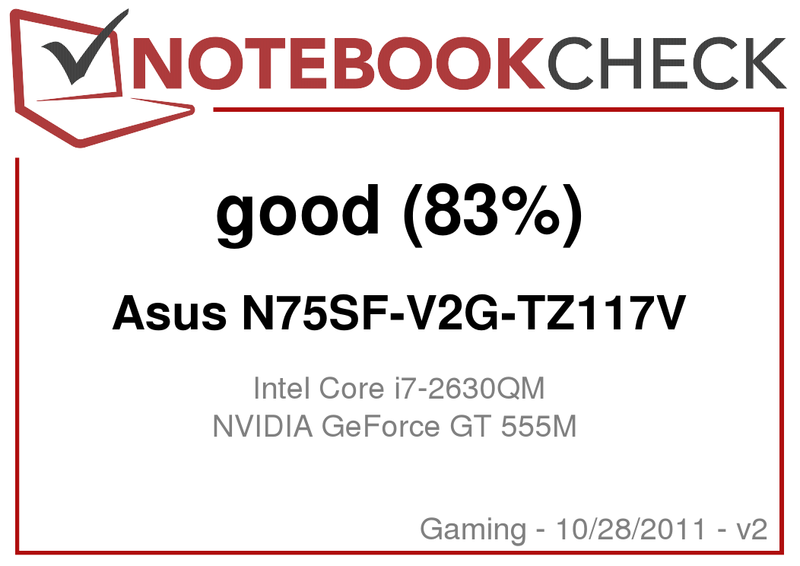 With this result, the N75SF places itself between midrange devices, such as the Acer Aspire 3830TG (GT 540M: 67 fps) and high-end machines, like the Medion Erazer X6817 (GTX 560M: 143.7 fps). 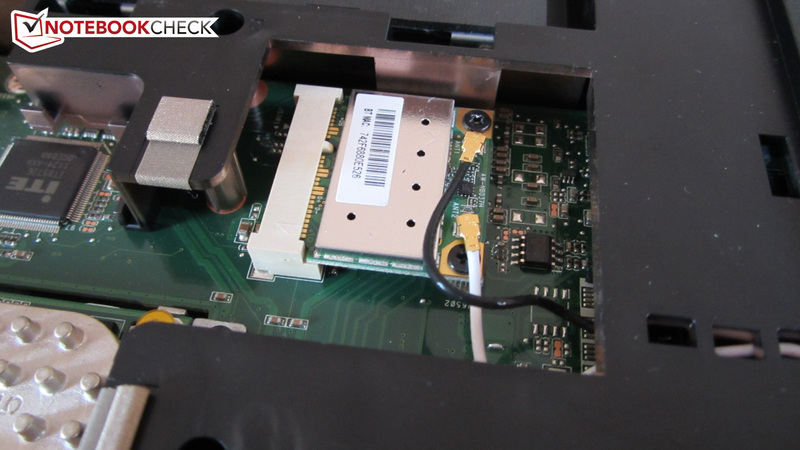 As our benchmarks show, the GeForce GT 555M frequently starts to stutter in the Full HD resolution. Maximum details aren't possible with graphic-intensive tracks. The performance is only sufficient for the medium quality level in some cases. In contrast, less demanding games, such as Fifa 12, can be rendered smoothly even with antialiasing. In view of the graphic performance, we would deem 1600x900 pixels to be perfect. If gamers can live with reducing the resolution and details where necessary, they will get an appropriate gaming companion in any event. Meanwhile, AMD fans will take a device with its equal, the Radeon HD 6750M, 6770M or 6850M. We were pleasantly surprised about the noise. 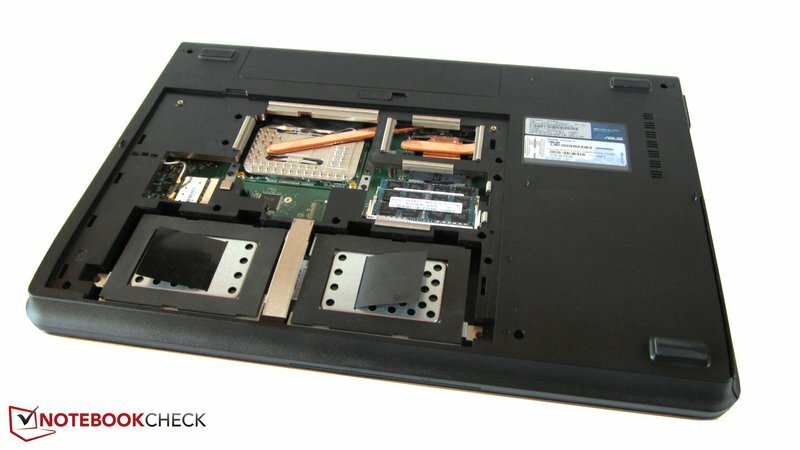 The case fan isn't necessarily quieter than other notebooks in idle mode, but the 17 inch laptop is fairly quiet during load. While many multimedia rivals surpass the 40 dB (A) mark in gaming mode, our meter only shows 34.2 dB (A) for the N75SF (distance: 15 cm). The notebook didn't get disagreeably loud even in full load. 37.4 dB (A) are absolutely acceptable. The hard disks are never disturbing either. Thus: Noise sensitive users can unhesitatingly take the N75SF. But what about heat development? There is hardly anything to criticize in view of temperatures. All surfaces of the case are absolutely within an acceptable range during undemanding tasks (Intel GPU active): An average of 25°C on the top and bottom are an excellent rate. The case gets warmer during gaming, but a maximum of 40°C (keyboard area) is still acceptable. 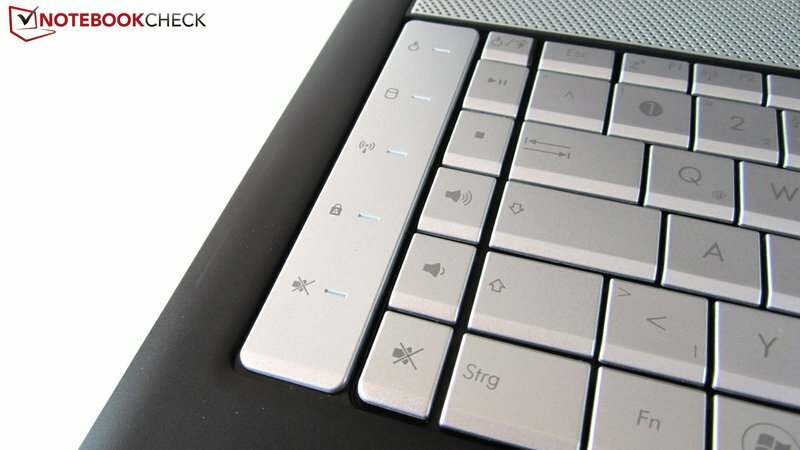 Great: The wrist rest doesn't exceed 30°C. 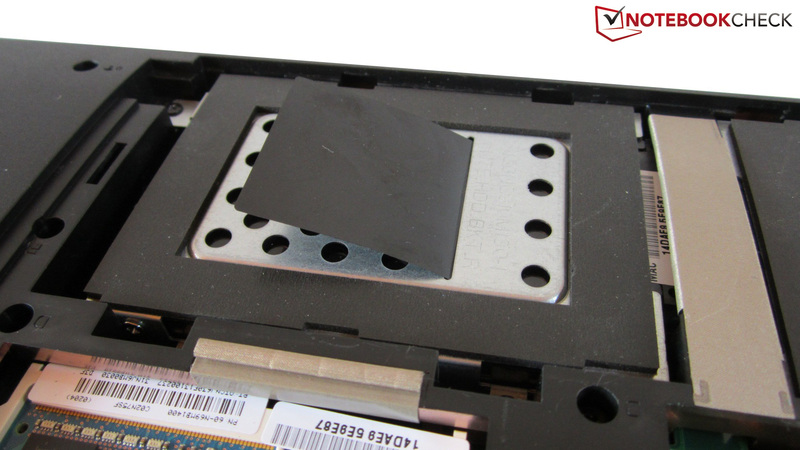 The components naturally reach much higher temperatures. 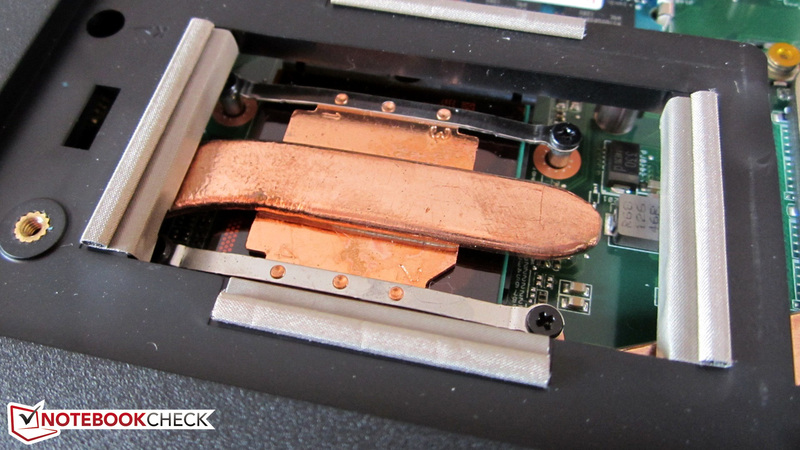 The graphics card and processor settled to acceptable 80°C in our stress test (Furmark & Prime95). This would be fine if Intel's Core i7-2630QM wouldn't throttle to 800 MHz during full load. We also had the feeling that the processor throttled during the practical gaming test due to temporary stuttering. But the frame patterns and benchmark results doesn't underpin this presumption. 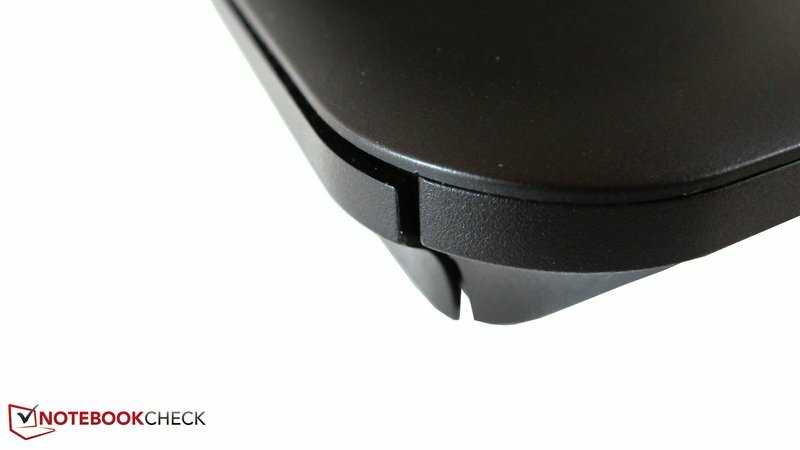 Should the notebook throttle during gaming, the tool "Throttlestop" might help. Asus advertises the N75SF with an "incomparable sound experience" on its homepage. 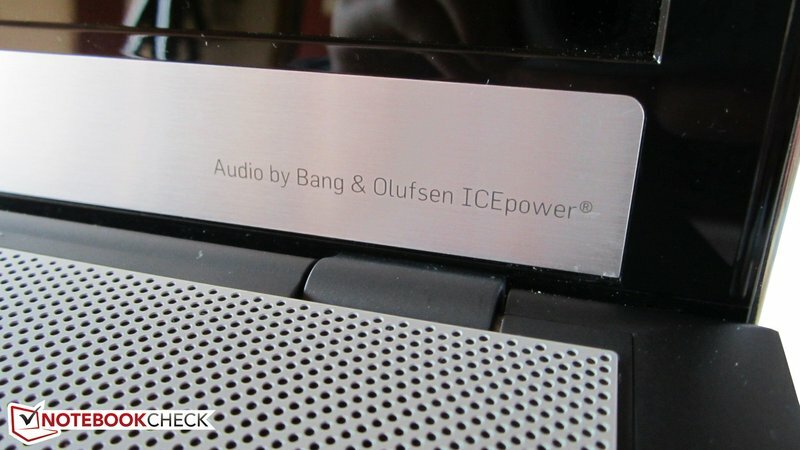 So that this claim can't be classified as the "usual marketing gibberish", the manufacturer has opted for cooperating with the sound experts Bang & Olufsen. The notebook is even delivered with a small subwoofer ("SonicMaster", weighs almost 150 grams) to make the sound experience perfect. The result is really impressive for notebook standards. It is possible to believe that an external sound system is connected when not listening closer. The sound is relatively natural, accurate and full. And thanks to the subwoofer, the user hears good bass. However, the speakers aren't absolutely perfect. Thus, the speakers tend to fray during intense load, and this is noticed more or less depending on the situation. In our opinion, the maximum volume could be a bit higher. But all in all, only few devices can hold a candle to the N75SF's sound quality (e.g. Dell's XPS 17). When Intel's HD Graphics 3000 is active in idle mode, the power requirement is kept within manageable limits: According to our meter, the 17 inch laptop only consumes around 20 watts. On the other hand, the N75SF draws between 87 and 122 watts from the outlet during load - an acceptable rate considering the available performance. 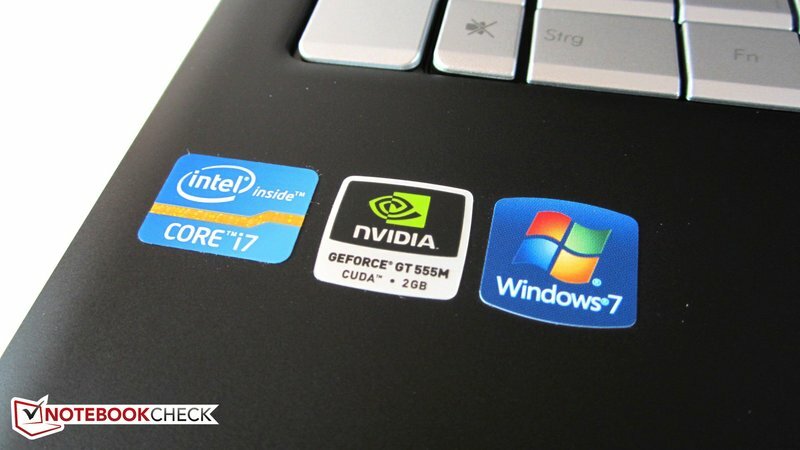 The 18 inch Acer Aspire 8951G (also Core i7-2630QM & GeForce GT 555M) consumed about the same in the test. Any expectations put on long battery runtimes due to the Optimus Technology won't be met. 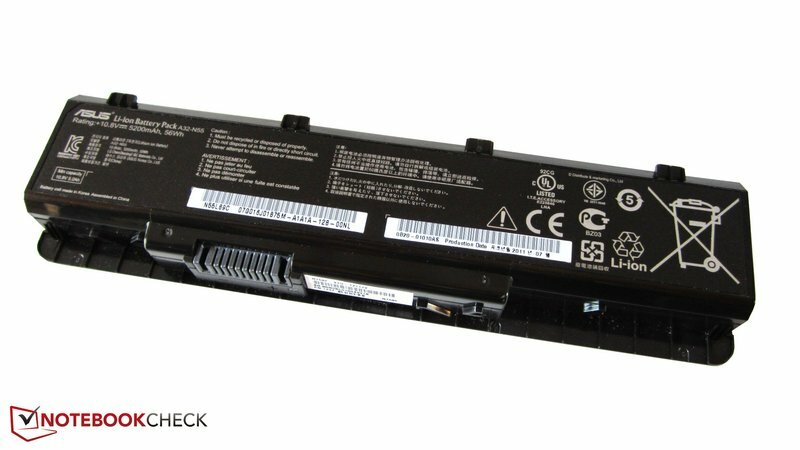 Asus only includes a 6 cell battery in the box. It is rather weak with 56 Wh (5200 mAh). The notebook shuts down after only one hour when minimum energy saving options and maximum display brightness are used during load. The runtime improves significantly without Nvidia's GPU. While our test DVD ran for almost two hours, the laptop lasted for about 2.5 hours during wireless Internet surfing (maximum brightness & medium energy saving settings). The battery life could only really impress us in idle mode with minimum brightness and maximum energy saving options. The hardware-friendly Reader's Test from BatteryEater ran good 4.5 hours. 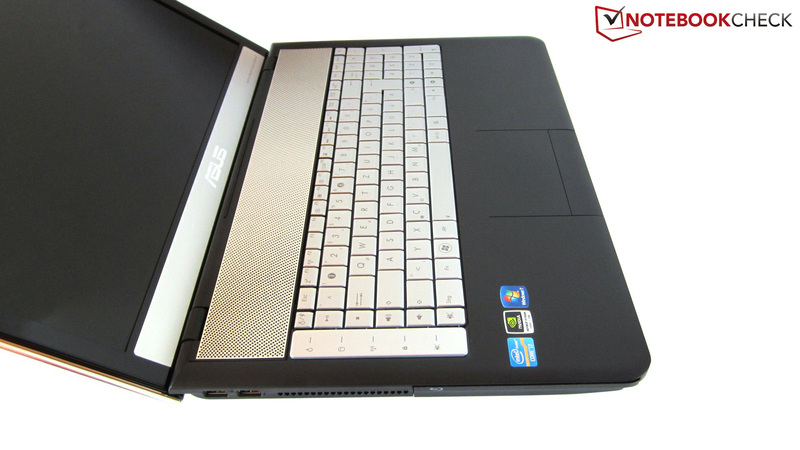 Although the N75SF just scrapes by a very good rating, Asus has developed a good multimedia notebook. The great sound system is not the only unique selling point, but the high-end screen as well. All kinds of media can freely develop their atmosphere - this is what we imagine a desktop replacement to be like. Asus has done everything right with the components. Intel's quad core processor has a good amount of reserves and a lot of data can be stored on both hard disks (2x 750 GB!). Nvidia's GeForce GT 555M is also a good choice, whereas compromises often have to be made in graphic options in the native Full HD resolution. Meanwhile, entertainment fans are supplied with a Blu-Ray drive. The big touchpad, the generous amount of supplies (mouse & subwoofer) and the low temperature, respectively noise development are additional plus points. However, various minus points thwart a better rating. Besides the fairly high weight and short battery life, the N75SF suffers from a moderate scope of interfaces. 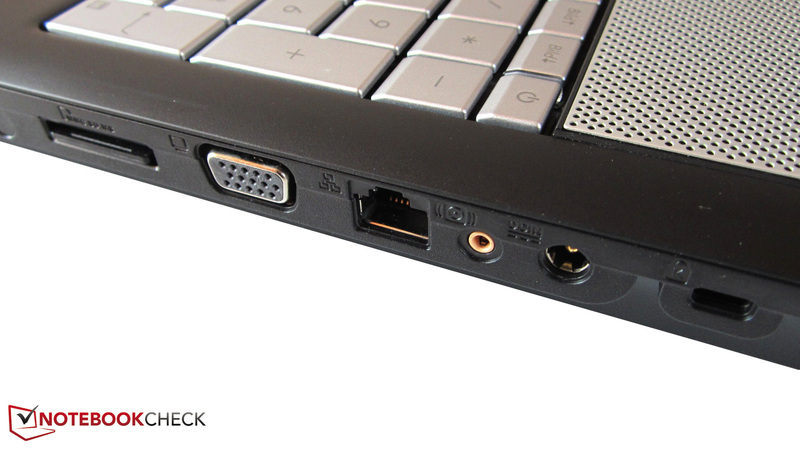 Many users would expect an ExpressCard slot, a FireWire and an eSATA port at a price of over 1000€. Not to mention the poorly planned arrangement of the existing interfaces. The keyboard is also sooner second grade, whereby the keyboard's poor lettering and unfavorably placed multimedia bar especially annoyed us. Additionally, there is the smudge-sensitive display lid and absolutely stuffed Windows installation. Nevertheless, users who are looking for a versatile entertainment platform with good image and sound quality will find it in the Asus N75SF. The black lid has a high-gloss finish. Eight GB of RAM are enough for the next few years. 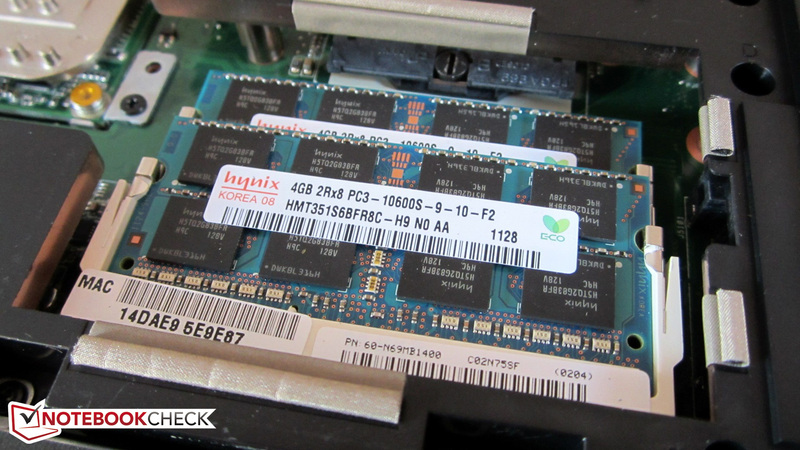 Asus builds in two 750 GB HDDs. The battery is a commonplace 6 cell model. The battery life is only average despite the Optimus technology. We would have preferred the multimedia controls on the right. The hardware is definitely impressive. Asus put a lot of value on a good sound. We would call the configuration opulent. The key lettering can hardly be seen from some angles. The touchpad has an agreeable size. The left has two USB 2.0 ports. Movie fan can take delight in a Blu-Ray drive and a Full HD screen. The drive in our test model doesn't close flush with the case. The right has two cutting edge USB 3.0 ports. The buyer has to live without ExpressCard, eSATA and FireWire. The power adapter's capacity is acceptable in view of performance. Of course, a WLAN module shouldn't be left out. Nvidia's GeForce GT 555M is an upper midrange model. Silver elements pep up the appearance. 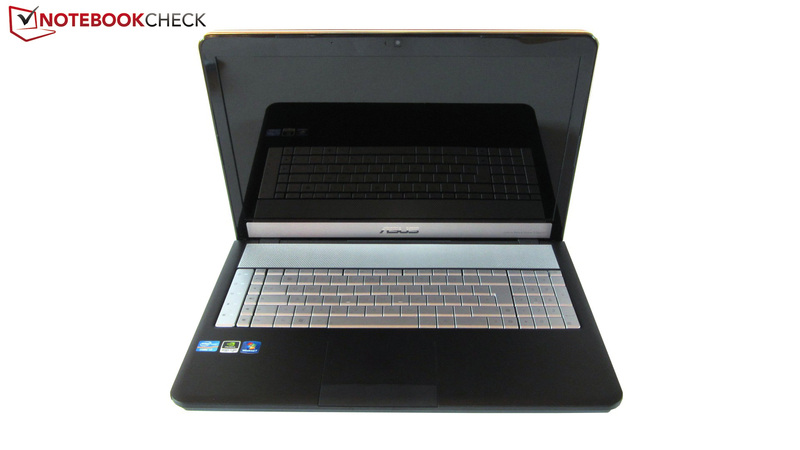 The multimedia laptop weighs almost 3.7 kilograms. The display bezel is just as extremely sensitive as the lid. 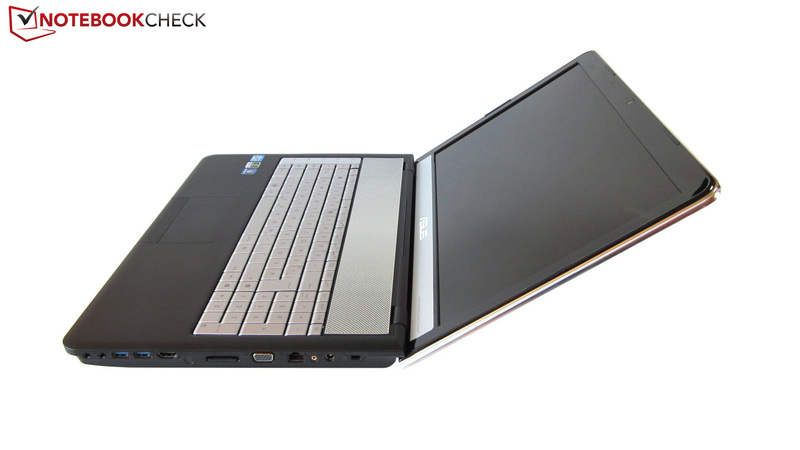 The 17 inch notebook has a height of about four centimeters. 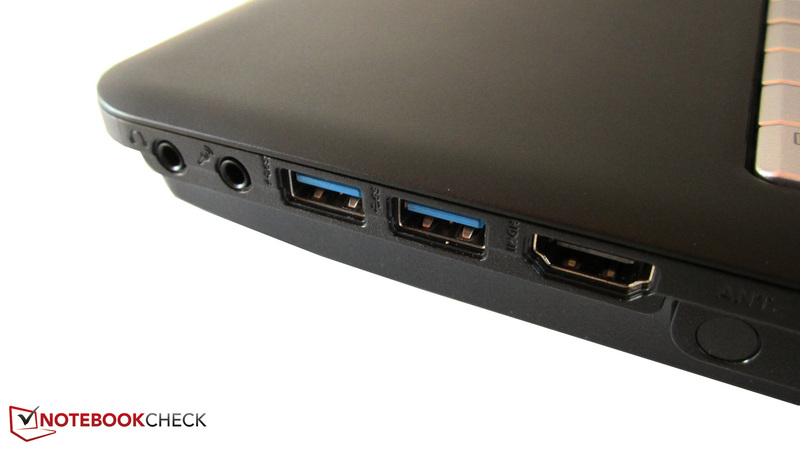 Asus has placed most ports on the right. The workmanship doesn't leave much room for complaint. The rubberized wrist rest has an agreeable size. There are no ports on the front or back. 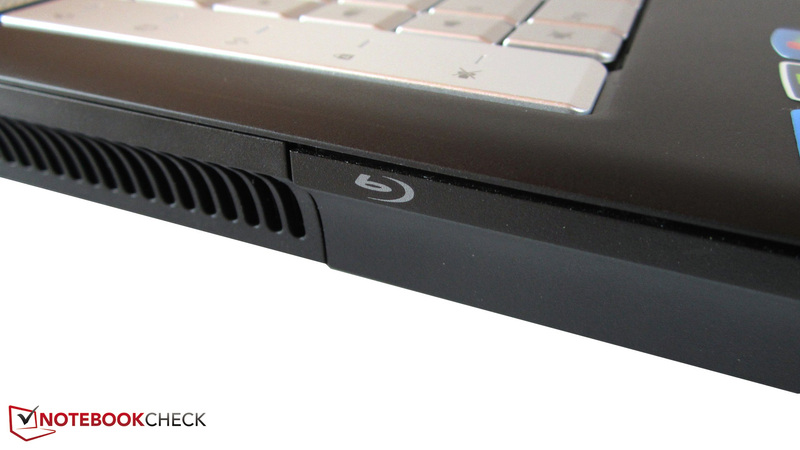 A bulky loudspeaker grille is found above the keyboard. The lid is quickly covered with fingerprints. The fan is directed toward the left. We don't like the interface arrangement as much. As usual, there is a removable cover on the bottom. Unfortunately, the fan can't be accessed directly. The case has enough room for two hard disks. Intel's quad core processor ensures a high application performance. 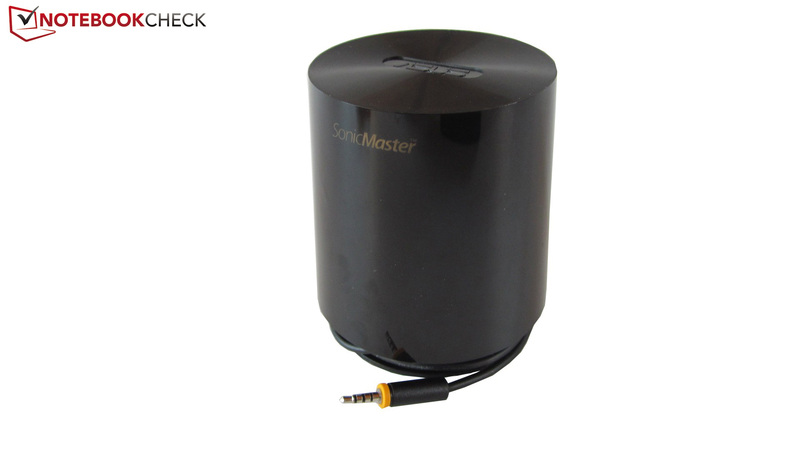 The included "SonicMaster" supplies a good bass. 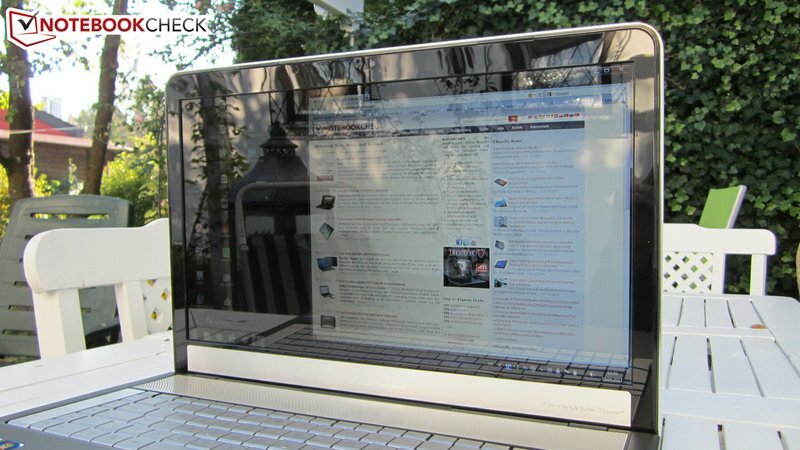 Asus uses a high-end screen. More ports and a better keyboard. The sound quality is beyond any doubt. 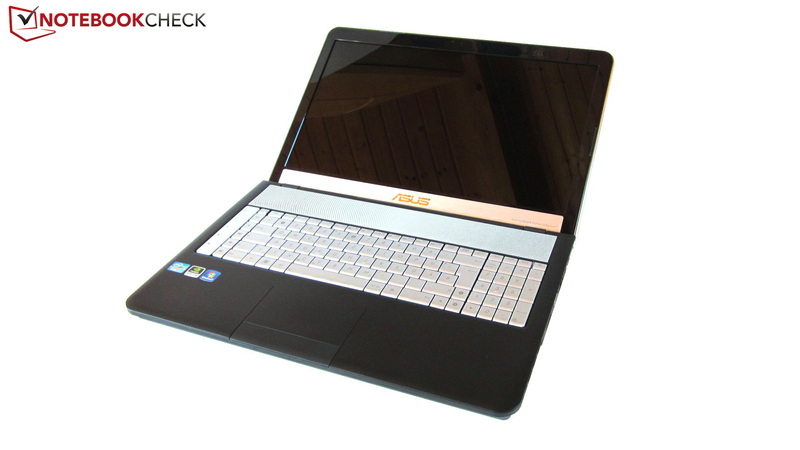 17 inch multimedia notebooks with a gaming capable graphics card, such as the Acer Aspire 7750G, the Dell XPS 17, the Fujitsu Lifebook NH751 or the Samsung RF711.